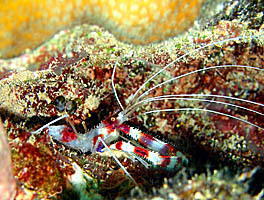 Easily the best picture of a Banded Coral Shrimp I've ever seen. David Bolme took this picture. Click here to see this picture up close. 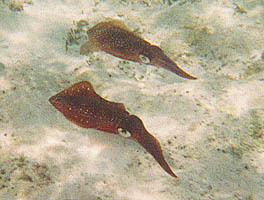 Caribbean Reef Squid hunt in formation, swimming side by side above the reef. Loren Toole took this great picture showing this squid behavior. 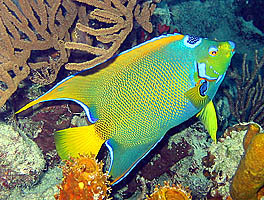 This adult Queen Angelfish displays its royal colors at a reef near the Exuma islands of The Bahamas. Copyright © 2006 ReefNews, Inc.